Specially formulated to be taken during & after the menopause. With vitamin B6 which contributes to the regulation of hormonal activity. The Queen's Awards for Enterprise: Innovation 2018. Menopace does not contain any drugs or HRT. No gelatin or yeast. No artificial colours. No preservatives. Menopace is not tested on animals. Suitable for vegetarians. 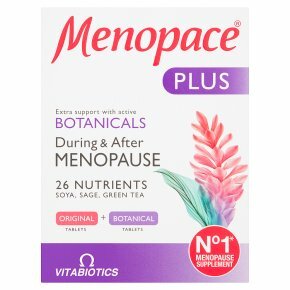 Extra Support from Menopace® Plus Optimum nutrition is important during the menopause. Menopace Plus includes all the benefits of the original Menopace formula plus an Active Botanical tablet. Original Menopace® Tablet Each tablet provides a scientifically formulated combination of vitamins and minerals. Hormone Regulation - Contains vitamin B6 which contributes to the regulation of hormonal activity. Bone Health - Vitamin D, magnesium and zinc contribute to the maintenance of normal bones. Heart Health - Thiamin (vitamin B1) contributes to normal heart function, whilst vitamins B12 and B6 contribute to normal homocysteine metabolism. Active Botanical Tablet Each Active Botanical tablet provides a special blend of natural plant extracts. Soya Isoflavones - Soya is one of the richest natural sources of Isoflavones. Sage - Often used during the menopause. Flaxseed Lignans - Concentrated flaxseed extract is a particularly rich natural source of SDG (secoisolariciresinol diglucoside). Green Tea - Contains standardised extract of 55% polyphenols, the active components of green tea. Active botanical tablets provide: Extra Soya Isoflavones** Green Tea Flaxseed Lignans Sage **Compared with Menopace® Original. FOOD SUPPLEMENT<br>Food supplements must not replace a varied and balanced diet and a healthy lifestyle.<br>As with other food supplements, consult your doctor or pharmacist before using if you are under medical supervision, have epilepsy, a thyroid condition, haemochromatosis, suffer from food allergies, or are allergic to any of the ingredients.<br><br>This product contains iron, which if taken in excess, may be harmful to very young children.